In recent decades, gender differences have converged in relation to labour force participation, paid hours of work, hours of work at home, lifetime labour force experience, and occupations. In addition, women have outnumbered men in higher education for several decades (Blau and Kahn 2017, Bertrand 2011, Goldin 2014). However, despite a considerable decrease in the gender earnings gap, substantial gender inequality persists. In particular, the convergence in earnings has been slower in the upper part of the earnings distribution, where middle-aged men remain dominant in the highest earning occupations (Blau and Kahn 2017). This pattern is remarkably similar across countries, despite large differences in family policies. The cause of this stagnation remains a puzzle. A large and growing literature suggests that childbearing negatively affects the career paths of women and that the gender earnings gap increases at the onset of parenthood (Bertrand et al. 2010, Kleven et al. 2018, Angelov et al. 2016). For instance, in a recent study, Kleven et al. (2018) find a sharp decline in women’s earnings after the birth of their first child, with no comparable salary drop for men. They estimate that women’s earnings are 20% less than that of their male counterparts, even ten years after parenthood. There are several potential explanations for this divergence in earnings post-birth. First, there is empirical evidence that the labour force participation of women changes at both the extensive and the intensive margins post-birth. Second, Hotz et al. (2018) document a strong tendency for job changes to more family-friendly firms following childbirth, accompanied with lower earnings and career prospects. Focusing on highly educated women, Goldin (2014) argues that in order to get a better understanding of why women still earn less than men, we need to study how the earnings gap evolves along several dimensions. For instance, Bertrand et al. (2011) and Goldin and Katz (2016) reveal that the earnings gap changes over the course of the careerand that while the earnings gap is huge in some occupations, it is more or less absent in others. They argue that the production structure or work organisation differ across industries. In particular, Goldin (2014) documents that in some occupations, increasing the number of hours worked per month has a large effect on earnings, indicating a disproportionate and strongly convex earnings structure. In other words, there is a large increase in compensation for workers who can work for long hours and particular hours, even though they may not have a higher level of human capital than other workers. One reason for this is that, in some professions, e.g. trial lawyers or consultants, the roles cannot be easily performed by other workers who are not close substitutes. There is a high demand and, correspondingly, high compensation for personalised services and face-to-face time in these sectors. As a result, some high-paying professions have a highly nonlinear or convex wage structure. If mothers with young children prefer more flexible schedules, sectors with a nonlinear wage structure—where many women with MBAs or law degrees work—are less attractive. These mothers may be willing to trade lower pay for a more flexible work schedule. Hence, the earnings penalty for motherhood might be much stronger in sectors with a nonlinear wage structure. On the other hand, in science, medicine, and pharmacy, tasks are less personalised, working hours are better regulated, and the wage structure is more linear (Goldin and Katz 2016). Thus, the earnings penalty for motherhood may be less pronounced in these professions. To address the hypothesis above in our recent study (Bütikofer et al. 2018), we use rich, population-wide register data for Norway, and focus on men and women who have become parents and, based on their educational choice and early career, have a high probability of becoming top earners. In particular, we compare the effect of parenthood on the careers of high-achieving women relative to high-achieving men in a set of high-earning professions, which differ with respect to the convexity of wage structures. High achievers are defined as men and women who have completed a graduate degree in one of four professional areas—business, law, medicine, or science, technology, engineering, and mathematics (STEM)—who rank among the top 20% earners compared with others with the same degree and from the same graduating cohort, in any of the first three years after graduation. Individuals graduating with an MBA or a law degree are most likely to be recruited by the finance sector, consulting firms, or law firms, which are organisations with highly nonlinear wage structures. Hence, we focus on a subset of the population with very high potential earnings, who are likely to end up in professions with different wage structures. Figure 1 illustrates the association between the earnings rank by degree and cohort during the first three years after graduation and the earnings rank at age 45 for men and women with an MBA, law, STEM, or medical degree. The pattern suggests that there is a positive association between early career earnings rank and the earnings rank later in life. In particular, individuals who rank in the top 20% of earners early in their career are, on average, at the 90th earnings percentile or above at the age of 45. Moreover, the association is very similar for men and women. These descriptive findings support our definition of the early career track sample for both men and women. 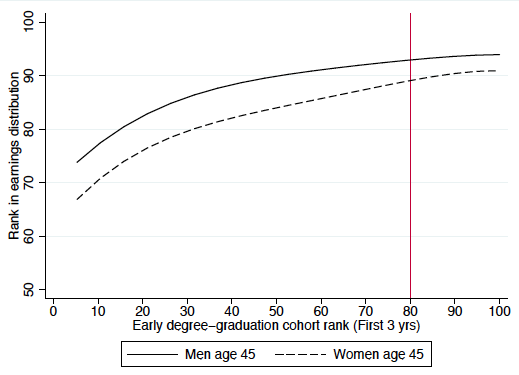 Note: The figures show the marginal effects from two OLS regressions (one for men, one for women) of the relationship between an individual's best rank by degree and cohort during the first three years after graduation and the rank in the income distribution achieved at a specific age mid-career. The regression includes early rank as a quartic, year dummies, and individual controls (age, age squared, years of education), and is estimated separately for men and women with one of the four top graduate degrees, i.e. an MBA, law, STEM, or medical degree. Following the approach in Kleven et al. 2018, we study the gender difference in earnings for those who have children—not the differential gender effect of childbirth on earnings compared with those who do not have children. Hence, the estimated gender gap following childbirth is independent of expected earnings trajectories after birth for men and womenand only depends on potentialomitted variable bias. We do, to some degree, control for selection on important observables by restricting the sample to high earners in the first three years following graduation. Moreover, all four degrees are elite areas of education, entry to which requires the highest grade point average from high school. When we estimate the child earnings penalty separately for high achievers with each of the four top-degrees, we arguably have a causal effect within each degree. When comparing the results across the four degrees, we have to remember that the choice of education, profession, and career path is endogenous, and there may be unobservable differences influencing individuals’ selection of different professions. This part of the analysis mustthereforebe considered as documenting the heterogeneity in the (causal) child penalty across top earners in professions with different expected wage schedules and work flexibility. Figure 2 shows the evolution of earnings for men and women based on an event-study specification, where predicted earnings are measured relative to the year before the first child is born for high achievers with an MBA (panel a), a law degree (panel b), a STEM degree (panel c), or a medical degree (panel d). We find a quite large initial drop for women across all four samples. 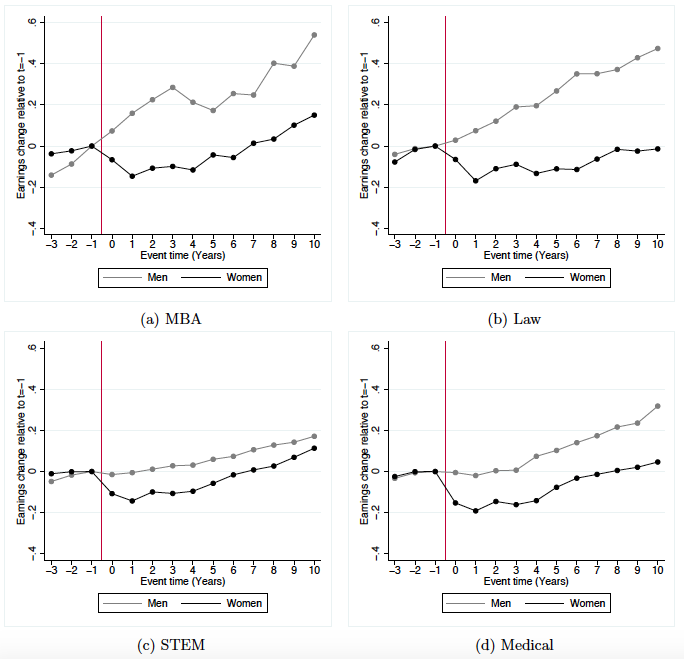 In sum, the pattern of gender gap following childbirth is similar for MBA and law graduatesbut stands in stark contrast to the pattern for STEM and medicine graduates. Note: The figure shows the estimated evolution of the earnings trajectories for men and women as a function of the event-period relative to the birth of their first child. Regressions include age dummies and calendar-year dummies, and we run separate regressions for men and women. The dots indicate that the event time effect is significant at the 5% level. The initial penalty is rather similar across the four degrees, but we show that the penalty is smaller than for a sample of women with any graduate degree. The evolution of earnings later in the career indicates that the effect of a childbirth differs across these four professional degrees in an interesting way. While MBA and law mothers never seem to recover career-wise, the earnings evolution of STEM mothers and fathers converges, while they are parallel for male and female doctors. The main reason for the lack of convergence between men and women in the first two groups is that men with an MBA or a law degree continue on the same earnings trajectory that they were on prior to having a child, i.e. they do not suffer from a child earnings penalty at all. To further investigate the career effects of parenthood, we repeated the estimation above for a subset of even more career-oriented individuals, i.e. we restrict the sample to individuals among the top 10% of early career earners. Again, what is striking when we compare the earnings trajectories of these two different early career groups is how the patterns differ between those with an MBA or a law degree on the one handand those with a STEM or a medical degree on the other. The earnings loss due to childbirth is larger for the more ambitious MBA and law mothers with higher early earnings rank. Interestingly, for this group of 10% of early career female earners in STEM, there is no visible difference, while the pattern is the opposite in medicine: after a few years of earnings loss, the earnings of female medical doctors almost overtake those of their male counterparts. This result further suggests that women in professions with more nonlinear wage structures suffer from a larger and more persistent child earnings penalty than do women in professions with a more linear wage structure. Angelov, N, P Johansson and E Lindahl (2016), “Parenthood and the gender gap in pay”, Journal of Labor Economics 34(3): 545–579. Bertrand, M (2011), “New perspectives on gender”, in O Ashenfelter and D Card (eds. ), Handbook of Labor Economics Volume 4: 1543–90. Bertrand, M, C Goldin and LF Katz (2010), “Dynamics of the gender gap for young professionals in the financial and corporate sectors”, American Economic Journal: Applied Economics 2(3): 228–255. Blau, FD and LM Kahn (2017), “The gender wage gap: Extent, trends, and explanations”, Journal of Economic Literature 55(3): 789–865. Bütikofer, A, S Jensen and K G Salvanes (2018), “The role of parenthood on the gender gap among top earners”, European Economic Review 109: 103-123. Goldin, C (2014), “A grand gender convergence: Its last chapter”, American Economic Review 104(4): 1091–1119. Goldin, C, LF Katz (2016), “A most egalitarian profession: Pharmacy and the evolution of a family-friendly occupation”, Journal of Labor Economics 34(3): 705–746. Hotz, VJ, P Johansson and A Karimi (2017), “Parenthood, family-friendly firms, and the gender gaps in early work careers”, NBER Working Paper 24173. Kleven, HJ, C Landais and JE Søgaard (2018), “Children and gender inequality: Evidence from Denmark”, NBER Working Paper 24219.